Viral Content: Does It Really Matter? “Going viral”. It's a phrase you hear a lot in today's digital marketing world. It seems like everyone from new, solo bloggers to a multinational corporations wants their content to go viral. Viral marketing content can be an asset to a business. But is it required for a company to have marketing success? And is it something you and I as marketers should be focusing on trying to create? The meteoric rise of online marketing, especially of content marketing and social media has fueled the concept of viral content. And having a piece of content, whether a video, blog entry, white paper or infographic go viral can add a boost to a company's marketing results. Even if content does go viral, does that always mean an increase in sales? And isn't sales the ultimate goal in marketing? If your content gets viewed, shared and talked about by thousands or even millions of people but that has no direct or even indirect effect on increasing sales, do you really care that it went viral? Many in the world of branding and image advertising get so caught up in the idea of producing an ad that is artistic or “cutting edge” they forget about the number one job of advertising – to make sales! And there have been lavish, big-budget content pieces that went viral but did not help the company sponsoring them make sales in proportion to the hype they generated. Think about that quote for a moment. Of course many of us in the online marketing world would love to have a “viral hit”. But ask yourself this question: “Do I really care if my content goes viral if it doesn't mean more sales for me?”. Maybe the Roller Babies video led to more sales in years following the one in which it was released, but given the fleeting nature of viral content buzz, probably not. So content going viral is no guarantee of increased sales. And you and I can enjoy great marketing success even if we never have the first piece of viral content. But we still want our content to get noticed and shared, don't we? Of course we do! And at the same time, we want it to persuade readers and viewers to become customers. Viral Content – A Nice Bonus. Nothing More? There are proven steps we can take to get our content shared more often. There are also proven steps we can take to make it a more persuasive marketing tool. Let's do both. And let's not obsess over whether or not it goes viral. If we take steps to get it spread and it does its job of driving more leads through our marketing funnel, great! If it goes viral, that's a nice little added bonus. Let's look at it as nothing more than that! Some online authorities, including Derek Halpern, insist that you can routinely make your content go viral. True or not, you can take steps to make it more likely to spread. In this article, he refers to the work of Wharton Marketing professor Jonah Berger regarding what makes online content go viral. Content that produces a “high-arousal” emotion, whether positive or negative, is more likely to go viral than content that does not. Content that is useful from a practical standpoint is more likely to get shared so much it goes viral. So if you want your content to get shared a lot, to the point it just might go viral, why not combine these two factors? Emotion fuels action. Why not write content with a strong emotional component? And why not make this same content piece full of practical, useful advice? Wow! Talk about a powerful way to get your content shared more often! Also, make your content easy to share. Have social sharing buttons on your blog and in your emails. Have a sharing call to action – ask your readers to share your content for you. Harness the power of visuals in your content. Visuals help your content get noticed initially; people are drawn to infographics, photos and other images (remember to keep them relevant to your content and to avoid stock photos). Content with strong visuals also tends to get shared more often. It's a cliché, but true: people tend to buy from those they know, like and trust. Couldn't the same thing be said for sharing your content? If your audience feels like they know, like and trust you, and you produce great content that arouses their emotions and is easy to share, don't you think they are more likely to share it? So work to develop a relationship with your audience, one that makes them want to share your content for you. So you've succeeded in getting in your content shared more often. Great! Maybe it's gone viral. If so, that's a nice bonus. If not, don't sweat it. A lot of online marketing empires and very successful businesses have been built that had zero viral content. But regardless of how often it's shared, you want it to do its primary job – to drive the sales process forward. In a B2C online marketing environment, that ultimately means converting sales in your e-commerce store. In a B2B environment that means driving leads through your pipeline from one piece of content to the next until the time is right for a sales rep to get involved in the process. So to be an effective marketing piece, your content has to do far more than entertain. The Evian babies on roller skates viral video is very entertaining, but is there any evidence it increased sales of the Evian product? A big part of the battle in online marketing is getting and keeping your reader's attention, so a certain amount of entertainment value may help you convert some readers into buyers. But there needs to be much more. 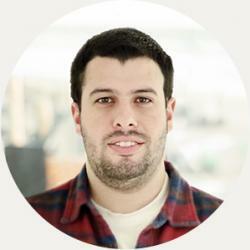 You need to follow the proven rules of effective copywriting. Your content needs to focus on your reader, the problem he has, and your solution for that problem. Your content needs to persuade, not merely entertain or inform. It needs to be part of your online marketing “mechanism” that builds momentum towards the ultimate sale. And to help you reach that ultimate goal of making an online sale, you need landing pages. Remember that the reason we want our content to get shared - whether it goes viral or not – is to drive the sale process forward. And if you are wanting to make sales online (or “sales” of your latest piece of content, in B2B marketing), a well-engineered landing page with solid, persuasive copywriting and content will help you reach your goal. And no landing page platform will do more to help you convert your viral content readers into buyers than Lander. 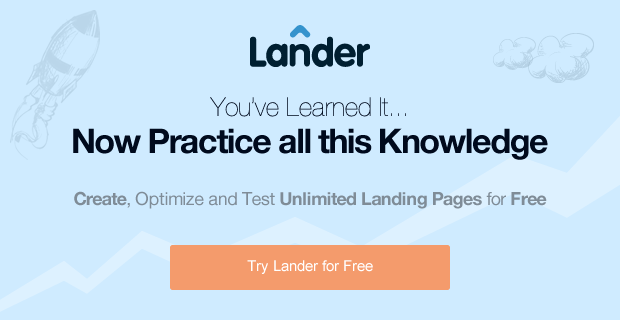 Lander is optimized to help you enjoy a higher conversion rate. It offers you advanced split testing capability; you can make decisions based on real-time A/B testing feedback, decisions that consistently help you improve your conversion results! And Lander not only helps you experience a higher conversion rate, it's also a breeze to deploy and operate. It's the easiest-to-use landing page platform in the Universe! And here's a special “feature” you just might like: you can try any of our state-of-the-art landing page templates for free!